Are you ready for me to show you a period method for making a well-fitting front closure with hooks and eyes, taken from a dress in my collection? Sure you are! I have a circa 1850-60s green and wine colored stripe and floral silk dress in my collection that sets the eyes and hooks very much as the Harper's Bazar article article in Reconstruction Era Fashions (discussed in previous posts) directs. Why am I doing the closure now? 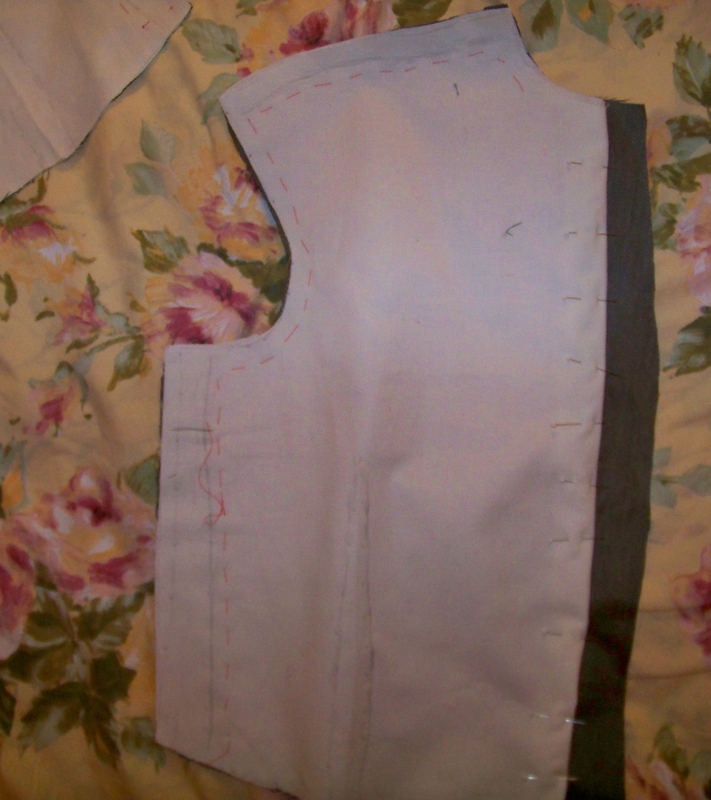 The Harper's Bazar article tells us that before sewing your bodice seams together, you finish the front closure. This seems counterintuitive, but if you finish it first, you can be surer of a nice gapless closure and can fix any fitting issues by testing the side seams before sewing them for good. So, after cutting out my interlining and fashion fabric pieces, and basting them to the lining with red thread, I was ready for the front closure. The TV 400 pattern gives you an inch hem allowance to create it. That's all you need. No extra underlap, no facing, nothing. First thing you need to know is that the eyes go on the left front piece as you look at the front of the bodice. 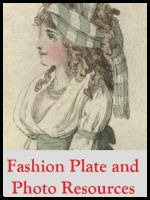 Now, let's look at our extant dress. The image below shows the front of the bodice, laid horizontally on top of some muslin. The brass eyes are protruding from between the fashion fabric and the lining. The eyes are sandwiched in between the layers. They won't catch on anything, won't tilt forward or backward, and are unlikely to come off unless ripped by main force. Below, the same brass eyes, seen from the lining side. Look carefully and you can see that the lining and fashion fabric are whip-stitched together. You can also see a few stitches at the eyes' bottoms where they are stitched to the inside of the lining. They are not stitched to the fashion fabric. The eyes, seen end on. 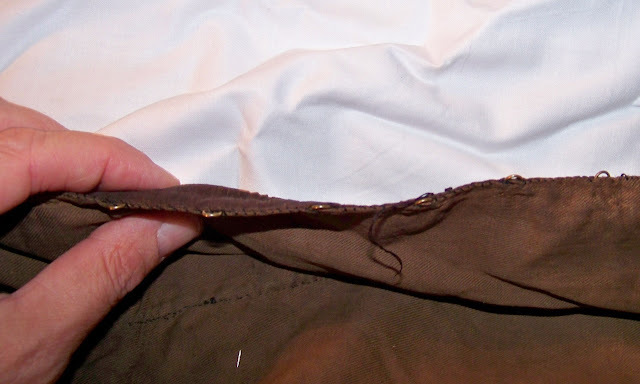 You can clearly see the black thread that was used to whip the fashion fabric and lining together. The eyes don't stick out very far, do they? Now, let's see what I did. Below, you see the front left piece, with lining upward, all basted. I folded under and pinned together the lining and interlining at the hemline in Heather's pattern...one inch in from the raw edge. I left the fashion fabric free, not pinned. 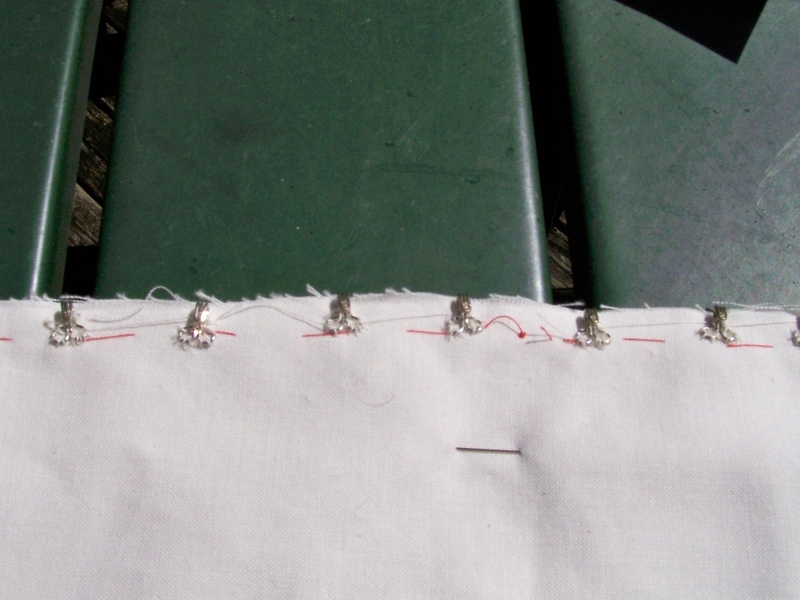 Next, I turned over the lining+interlining unit to the backside, and sewed on the eyes. The two little eyes are each couched down with thread all the way around the eye, not just with a few stitches, for sturdiness. So the bodice won't gap, just like on the original dress I spaced the eyes an inch apart. 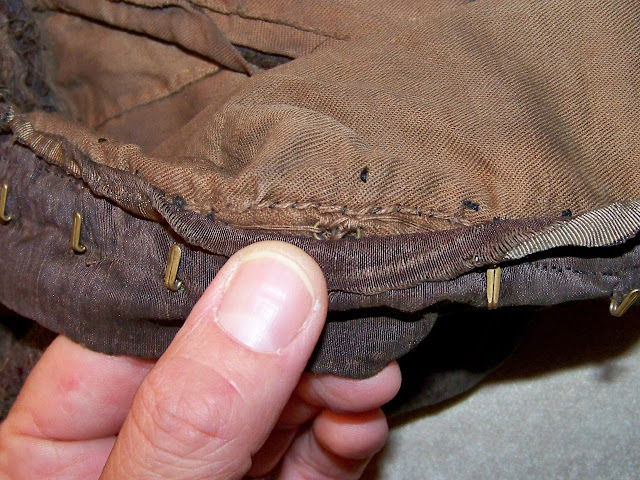 To speed the work, after you sew the first eye down, you just carry the thread to the next eye, and sew that down, and so on until you need a new thread. Sandwiched in between the lining and fashion fabric, it won't get pulled. This process took me an hour or so. With good music on it's not a problem: I listened to Claudio Monteverdi's 1610 vespers. 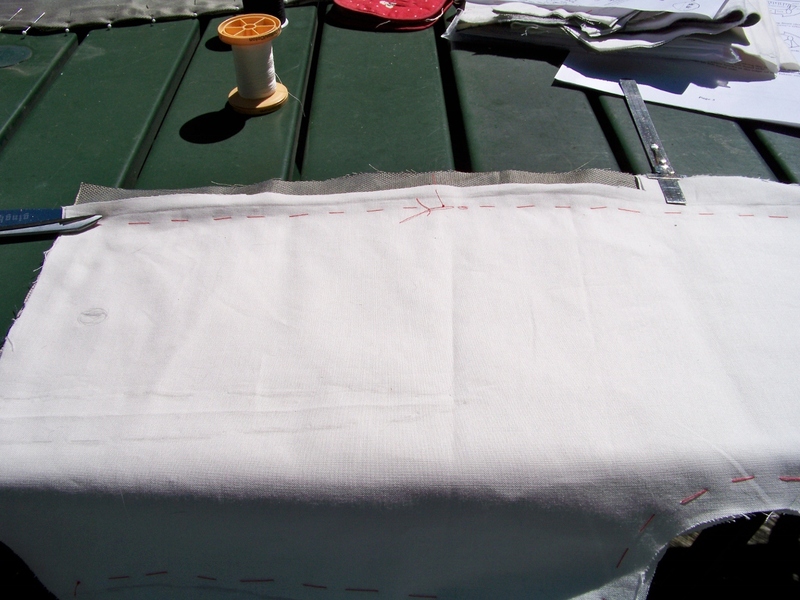 Next, I folded the fashion fabric hem allowance to the inside, and whipstitched everything together. 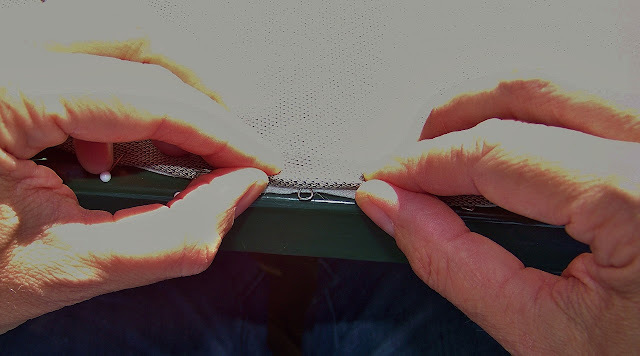 In the image below I am folding the fashion fabric's raw edge to the wrong side, next to the lining, making sure that the fashion fabric projects just a tiny bit out. Sadly, I don't have a picture of that at the moment. 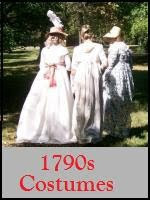 Let's look at the 1850s-1860s dress again, to see how the hooks were set. Again, very like how the Harper's Bazar article directs us. In the first image, below, we we are looking at the lining of the hook side of the front closure, laid out horizontally. The hooks are sewn down to the lining, without any stitches going out to the outside fashion fabric. The seamstress used thick thread, sewed the hooks down with lots of stitches, and carried the thread from hook to hook so she wouldn't have to tie off a thread and then start a new one each time. That line of thick backstitching above the hook? No idea what that's for right now. It doesn't show on the outside of the dress. The hooks are set far back from the closure edge so that there's no chance that the closure will be seen. By the way, aren't those hooks nice? Strong brass, and the shanks hammered a little flat. We don't have notions like that today, that I know of. 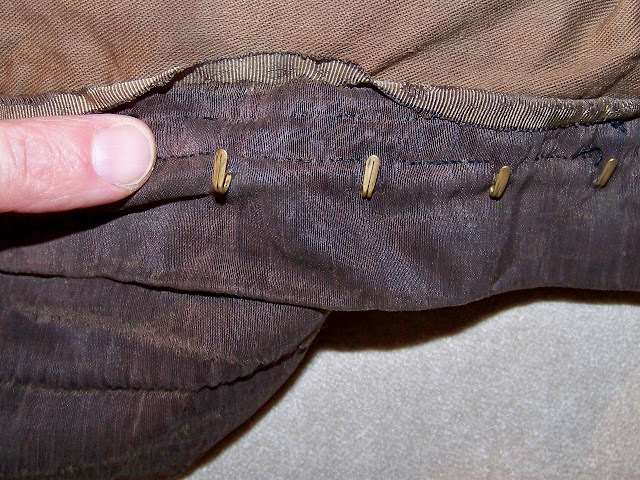 The seamstress or mantua maker included the selvage edge of the fashion fabric in her right front piece, a practical thing to do because once the hooks were sewn down, she could just turn the fashion fabric to the inside, right over the lining and not have to hem down the edge. What's that double line of stiching just above the hooks? Well, it strengthens the closure. The stitching, in black thread, goes all the way through to the fashion fabric. The seamstress was very clever...you cannot see the stitching because it is set at the two edges of a stripe in the fabric. The line of stitching closest to the end of the hooks is discontinuous: it stops at each hook and starts again after each hook. You know, then that these are very long hooks. The upper line of stitching is continuous. The final step is to make a tiny hole with a stiletto -- between threads, not cutting them -- and poking the hooks up through the hole. When closed, the hook side of the bodice overlaps the eye side and hides the join. 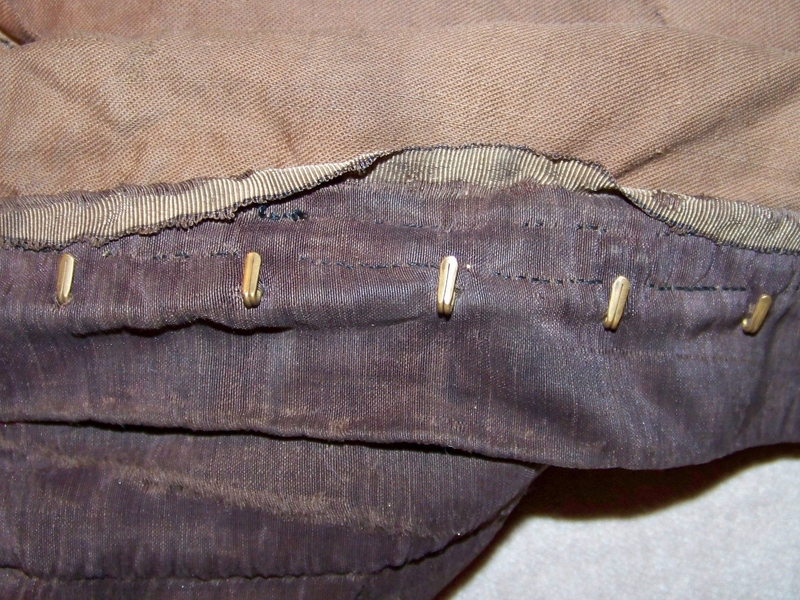 In this case, the lap ends at dead center of the bodice, so that the closure line is in the center. You would have to do some measuring and careful fitting to make sure that you ended up with this effect: your eye side would have to go past the center front, while your hook side would have to end at center front. However, if you are going to place non-functional buttons on top, as I am, then you allow the overlap to be off center, and sew the buttons on so that they line up at the center line. A side note: the fabric on the 1850s-60s dress is amazing. 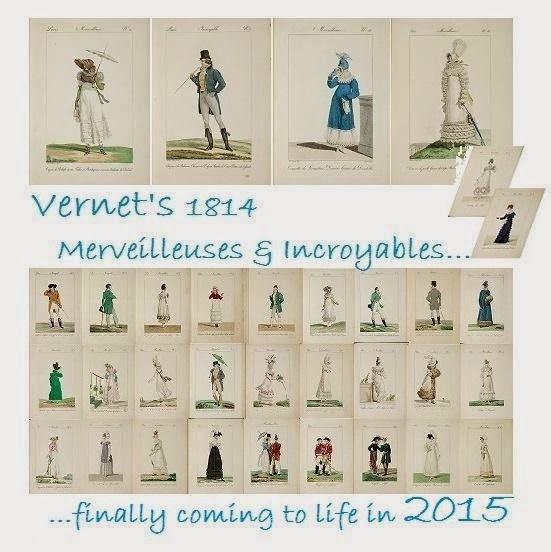 It's very tightly woven and includes moire and jacquard patterning. It's also strong, dense, and supple. Amazing stuff. Anyhow, on my bodice, here's what I did. First, I trimmed off the outer edge of the closure edge to almost one inch in. Next I laid down the front piece with the completed eyes on top of the front piece that gets the hooks. I matching up the bottoms and the closure point so that I could find exactly where to sew each hook. To mark the spot for each hook, I drew a little dot through each eye down onto lining side of the piece that gets the hooks. Then I sewed down the hooks. 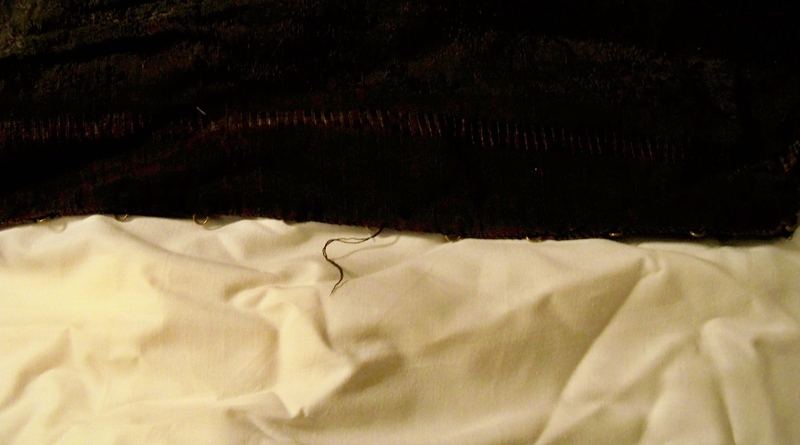 Just as with the eyes, I pulled the fashion fabric away so that I was sewing only to the lining, and made sure to anchor them firmly, sewing not only through the little anchor eyes, but stitching over the shank several times too, so that it wouldn't want to pull up when tugged at. Then I folded and pinned the outer edge of the fashion fabric right over the top of the hooks, allowing about 1/4" to project beyond the hooks. Then I turned a hem just at the bottom of the hooks. Below, the folding and pinning just beginning. The last step. I pushed the fashion fabric down until it was tight on at the top of the hooks and had a little excess, and then pushed and pressed with my fingers on the fabric over the top of each hook until it worked its way through the fabric. I have no stiletto, so had to do it that way. The little excess of fabric is needed so that the hook comes through not at the very edge of the closure, but inward a little bit so that there's a lap to hide the hooks when the bodice is worn. Once I finish the bodice, if it seems right I will also reinforce the hook side of the closure by hand-stitching at the base of the hooks, as invisibly as possible...hopefully the buttons will obscure anything that shows. Once you have set your hooks and eyes, you sew all the seams excepting the front to side front and the shoulder seams. Then you pin both those seams and try on the bodice. You want a snug fit. 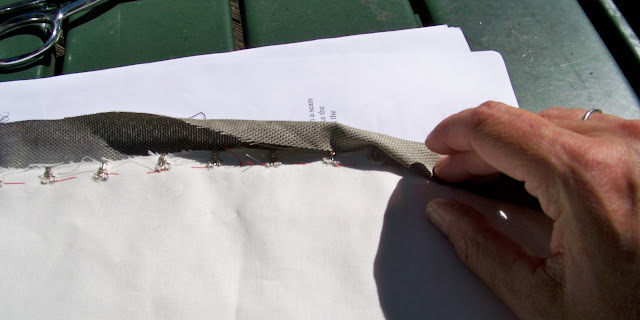 If your result is a little loose, either let out or take up the front piece's seam allowances at shoulder or side. Do not take up any of the back piece or the side piece. 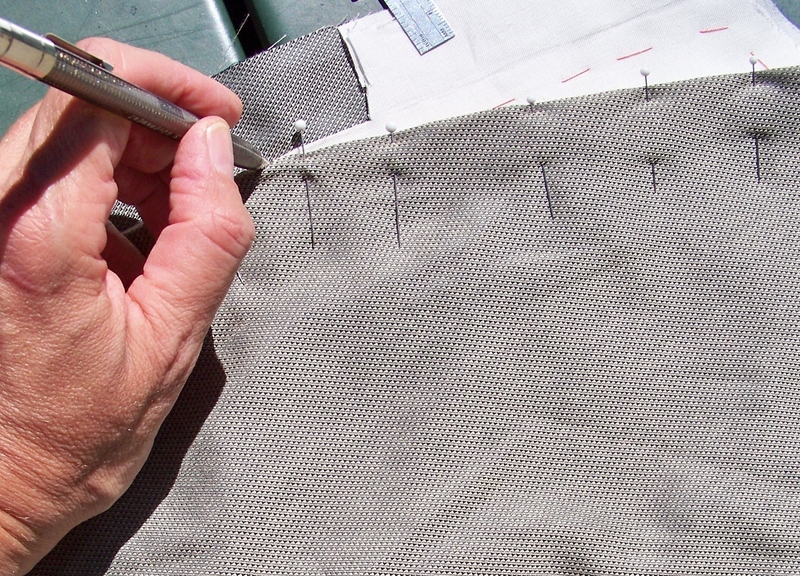 Once your fit is just right, then sew those last seams. We'll check this out next time. I love putting closures on the way they did back in the 19th century! They were really great at hiding hooks and eyes and still having a close fit. Thanks for the clear tutorial. The pictures of your extant garment are a nice addition. The reference of an original piece must be icing on the cake of this project!!! I love it when you'd be able to reveal/explain certain steps with the examination of an extant garment! That is so cool. The fastening first thing makes SO much sense too! Steampunk Black Dress: Whee! Bodice Fits! Steampunk Black Dress: Finished Petticoat!